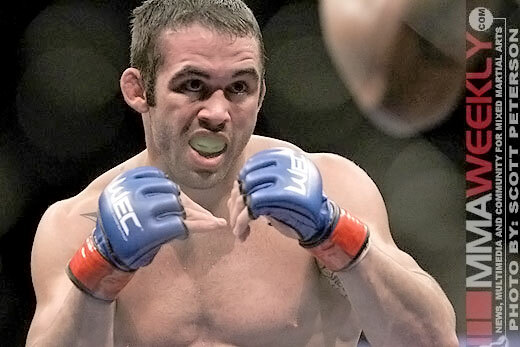 It looks like Jamie Varner will get his wish to fight in his hometown after all. The former WEC lightweight champion will return to action on Dec. 16 in Phoenix, Ariz., to face former Oklahoma State wrestler Shane Roller at WEC 53. The news of the bout was confirmed to MMAWeekly.com by sources close to the match-up with verbal agreements in place at this time from the fighters. Before the decision was read at WEC 49 in June, it seemed a lock that Varner (16-4-1) was on his way to a rematch with Ben Henderson for the WEC lightweight title. A controversial decision rendered the fight with Varner and Kamal Shalorus a draw, and so the former champion went on to face Donald “Cowboy” Cerrone in September instead. Varner came up short against Cerrone in their rematch, so he’ll look to get back on the winning track as he faces Shane Roller in December in his home state of Arizona. Roller (8-3) was looking for a title shot of his own when he faced Anthony Pettis in August, but the Las Vegas based fighter came up short. Pettis submitted him in the third round of their No. 1 contender’s match. It was the first time in his career that Roller had been submitted. Roller will have no easy test when he returns as he faces the former WEC lightweight champion. The bout between Varner and Roller is expected to fill part of the main televised card at WEC 53. More fights are expected to be announced in the coming weeks.